Lets talk paper work today. It’s important that during your cake consultation, you get exactly what you want on your cake – flavors and décor. 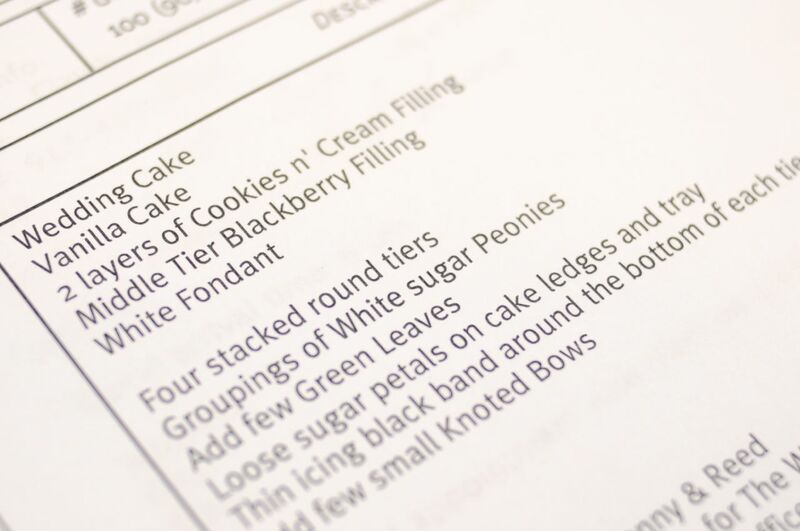 When you receive your contract from your baker all of the details should be spelled out for you. Are your cake fillings and flavors correct? Does it say how many tiers of cake you are getting? Does it specify the flowers on your cake are real or made of sugar? Is the language representing the surface design something you can understand? Do they have the correct arrival time of your guests? Is the date of your event correct? Do they have the correct address of the venue? Please consider all of these things when reading your paper work. You as the customer are just as responsible as the baker. If you signed the contract we interpret that as you have read all of the details and approved everything with your signature. ← How many tiers do I get?